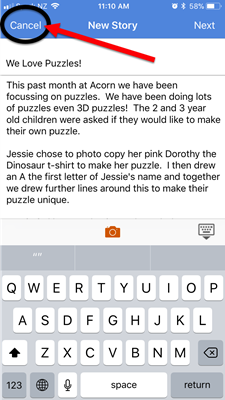 At any stage during the story creation process on the Educa Touch app you can tap the "Cancel" button in the top left corner to save your story as a draft. Once you tap "Save draft" you will be taken back to the Stories page, or your homepage. If you wish to access your draft story again, tap the "Draft" icon at the bottom of the screen. 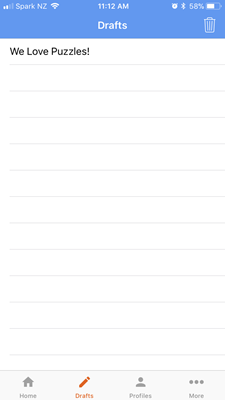 This will take you to a list of draft stories which have been saved to the app. If you wish to continue editing a draft, simply tap the title of that draft to select it. 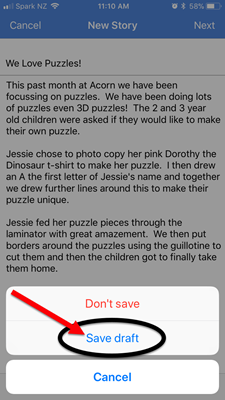 You can delete a single draft by tap and holding your finger on the title of the story you wish to delete, and performing a "sliding" or "swiping" action to the left. 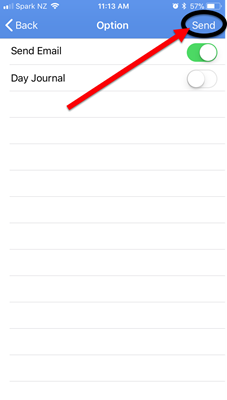 This swiping action will bring up a "Delete" button, tap to delete that draft. You can also delete all of your drafts in one go by tapping the trash can icon in the top right corner. If you need to save the story and have it accessible on another device, you can publish the story as a draft. It will then be available to you either from the publishing teacher's "My Stories" page, the child's "Draft Stories" page for individual stories or "Draft Group Stories" page for group stories. Publishing a draft can be especially handy when you need to add images or other information that are stored on your desktop or another device. **PLEASE NOTE** Published drafts are only accessible through the website. To publish a story as a draft, write your story and tap the "Next" button to work through each section of the story writing process until you get to the final page. 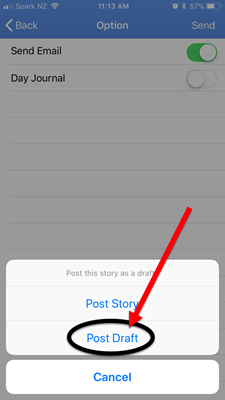 Go to post the story by tapping "Send" and then select "Post Draft Story".  Once the story is posted as a draft you will be able to access it from your Educa website for editing within a browser before publishing. 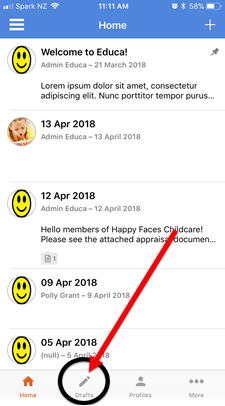 If you require any more information on Drafts or any other part of Educa please get in touch with us by emailing the Educa Support Team at support@geteduca.com or using the chat box in the lower right corner of your screen.